Hello lovely readers, it’s Jessi from Team LC again! I am so grateful for all of the sweet feedback from my last post, The Do’s and Don’ts of Your First Internship. Since a majority of you thought it was helpful, I thought I would address the number one question I received from that post with all of you: Where can I find an internship? 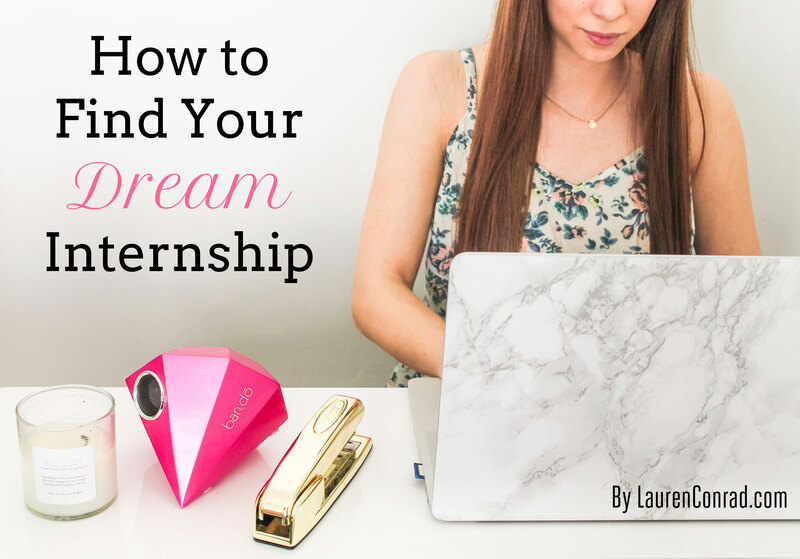 So today I will be tackling this question head-on and sharing a few tips on where to find your dream internship. It’s no surprise that social media is taking the business world by storm. Your favorite brands now have Twitter, Instagram, Facebook, and many other channels for you to catch sneak peeks and behind-the-scenes information. Another plus? Brands are now featuring job listings online via their social media accounts. Most companies will have a page on their actual websites addressing potential internship and job openings as well. If you don’t see this information, send a friendly email inquiring about future internship opportunities. Don’t be afraid to put yourself out there! Fun fact: I applied for LaurenConrad.com’s internship position because they posted about it on Instagram! Chances are that if you’re looking for an internship, you’re still in school. Use this to your advantage! Most companies prefer interns that can get college credit while simultaneously working for them. College career centers have hundreds of local and national companies that are more than happy to hire semester and summer interns. These companies are on your college career center website because they already have an established, positive relationship with one another. Take advantage of this free service while you can! Online job and internship hubs are not only great resources but will help you narrow down your search. Internship websites make it easy for you by tailoring your results based on your skills, experience, and interests. If you’re more of a creative type, DesignLoveFest has a job board filled with updated creative job openings. Are you looking for experience in print and media? Ed2010 can help you find your magazine dream job! I’ve personally used Internships.com to land semester editorial internships and have found that their website is user-friendly and updated frequently. Internship websites make it easy for you to get your résumé out into the workforce, and even notify you when they have a listing that matches your skill set. Résumés are living, breathing documents. It’s important to have an up-to-date résumé on hand just in case you see an internship opening or job position. As you grow, your résumé should grow with you. Think of it this way, your résumé is a reflection of your best accomplishments. Don’t be afraid to show it off! Traditionally, your resume should include your job history, past internships, volunteer work, and education. In today’s job market it’s also beneficial to let your potential employer know what skills you can bring to the table. Are you fluent in Photoshop? Do you have a knack for all things social media? Put it on your résumé! Reminder: Remember to keep your résumé short and sweet. A single page is best. I hope that you find these internship tips helpful! If you have any other internship-related questions, don’t be afraid to ask them in the comments below. Are there any topics you’d like to see me cover next?